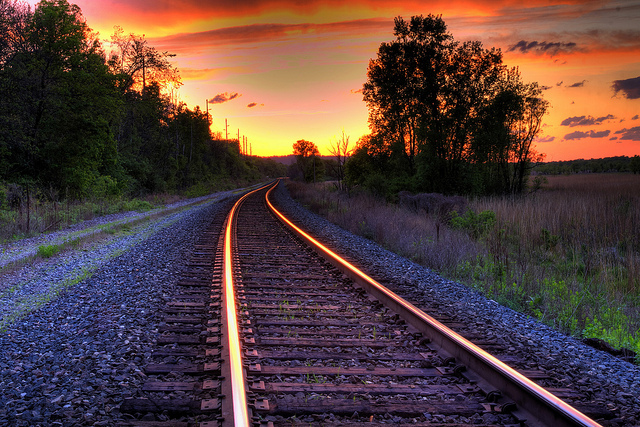 Do you remember the night by the train tracks? Two friends sitting on the rails. You laid back and wished for death. The air was cool, so you wanted to start a fire. My zippo was all out of fluid, so you kissed me instead. The moon lit your desire. Was it me or was it the night that turned you on? You took off your shirt and threw it in the distance. You said in space we won’t need clothes. Wrapped in the comfortable blanket of the cosmos. I reached out to touch your breast. Asked me if I was scared to die. I shook my head and said, only if I were to go without first tasting your skin. You smiled your devilish grin, and took me into you. Back arched over the spikes and rails. Do you remember that night by the train tracks? And you got me instead. Oh, life is so much more interesting than death. It’s really the best game in town. Great last line! I agree, death is the last great mystery, but life is like a great labyrinth full of secrets and surprises and I plan on taking as many detours and hitting every dead end so I can experience all life has to offer. Thanks again, and I feel like last lines can make a poem so I always try very hard to write a good one.